The Manchizzle: Not dead. Yet. Thanks for your touching emails of concern. No, I haven't died, I've been writing a novel for NaNoWriMo, which is just about to nudge past 25,000 words. I'm enjoying it, but it's a pretty weird process. It's kind of like driving through a snowstorm. You can't see where you are, and have only a vague idea of where you are going, so all you can do is go forward slowly and hope for the best. I have to say giving up blogging (well, mostly) for the month was a good idea. It made me realise just how much time I spend blogging and reading other blogs. But no worries, normal blogging service will resume in two weeks. And there had been some talk of another Manchester blogmeet... what does everyone think of the first weekend in December? I'm assuming weekends are better than weeknights, but maybe not...? And is it time to branch out from the Hare and Hounds/Urbis option... any ideas? A social event would be good, since I'm feeling a little bit like a hermit what with all this solitary writing, and have started talking to my cat. Not good. I did manage to get out of the house to see Tony Benn on Saturday at the Lowry. It was pretty great for me because I didn't know that much about him - he doesn't have a very high profile in the US - but this show, with folksinger Roy Bailey, was a brilliant introduction. What an amazing speaker Tony Benn is. 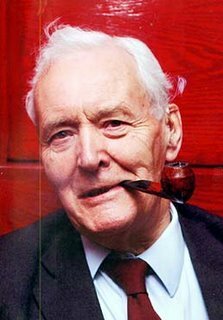 Benn talked about different protests and popular movements, working his way through British history. Now and then he'd take a break and let Bailey do a few relevant protest songs. While he was singing, Benn sat back in his chair, lit a pipe and looked on benevolently, as a great cloud of pipesmoke gathered over his head. Anywho, Crinklybee has just written a good bit about a misadventure on our newest pedestrian bridge here in Manchester, which he has christened Archie. Go read it, it's very funny. I saw Tony Benn & Roy Bailey @ Bury Met a couple of years ago.& that too was a great event.A must-see for any brain cell! Damn, I'm sorry to have missed the Tony Benn gig. Re. talking to your cat: it only becomes a problem if you don't have cat. Blogmeet happening: bring it on. Book authoring: good luck, etc. Count me in for the blogmeet. If only to gloat, along with Tim, Geoff and Norm that we are the only award-winning bloggers in Manchester. Two months on and still insufferable! Good luck with the novel by the way.